North Carolina Narrations: Get The Number Of That Truck, Please? I can't remember what we were talking about. We'd just dropped our youngest son off at the elementary school, and we were waiting to turn left to head up the road to the middle school to drop off our oldest son. Dan and I were both working at the high school, so we might have been talking about work. Maybe. I can't remember. My turn signal was on, and I was waiting patiently for a space in oncoming traffic so I could turn. The road we were on is a busy two-lane highway, but we were half a block from the school so we were still in the school zone. The route we were taking is the same one lots of parents had taken and were planning to take...it was familiar. I chatted with my husband, sitting in his usual spot--the passenger seat. Our oldest was quiet in the back seat right behind Dan, he might have been dozing. He did that in the mornings once he became a teenager. He might have been. I can't remember. I am a safe driver. I maintain a constant vigilance, fully aware of the idiocy of my fellow drivers. 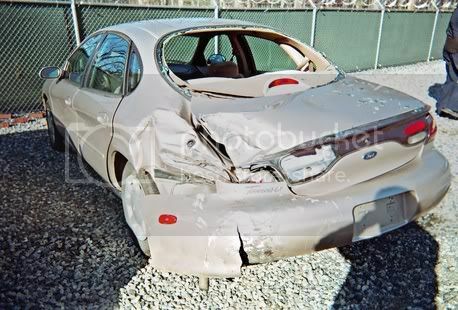 My driving record was perfect; the only accident I'd ever had involved accidentally backing into a car less than a month after I'd gotten my driver's license nearly two decades earlier. I saw a gap ahead, so I took my foot off the brake. Our Taurus was heavy, I wasn't worried about rolling. We'd just paid it off a couple of months before; it was the first car we'd owned that was almost new when we bought it. It was my dream car. My round of mirror checks, one of several while we waited to turn, took me to the rear view mirror. I might have seen the pick-up truck. I think I did. I can't remember. The volunteer fireman waiting at the stop sign at the same intersection did. Experience had him reaching for his cell phone and dialing those three little numbers. By the time he finished dialing, it was over. I didn't have time to warn my husband. I didn't have time to reach for my son. I had time to tighten my hands on the steering wheel and turn it to the front yard of the house on my right and pray I could keep us out of oncoming traffic. I can remember hearing the briefest squeal of panicked brakes...too brief. I can remember hearing a noise so loud, it seemed like the world was ending. I can remember saying a thousand wordless prayers in the brief gap between. Everything stopped moving a fraction of a second later. Time stopped, shock chased every sound away. I looked at my husband, who looked back at me without speaking. I spun to check on our son, sitting dazed in the back seat and covered in chunks of safety glass. Sound rushed back, and I popped out of the car and onto the front yard. The little Toyota pick-up truck, raised up on a lift kit for mudding, sat dead center in the intersection. Its knobby front wheels tilted out drunkenly on a snapped axel, dropping the front end so that it looked like a puppy ready to play. The teenager who'd been driving opened the door, still talking into his cell phone. If the truck hadn't fishtailed when the kid had slammed on his brakes, his high speed and lack of bumper would have carried it up and over the trunk...and into the cabin of our car. Instead, he'd soared up and over the corner, leaving paint from his truck on the roof along the driver's side. We lost the car. We could have lost a lot more. I thought every moment of that crash would be imprinted on my brain forever. This prompt is a memoir piece in response to a flash prompt from Write On Edge, to write about a memory the word CRASH evokes in ten minutes or less. This memory is never far from my mind, even though it happened six years ago. How about you? What event from your past did you think would be permanently engraved on your brain...but now is fading? I LOVE the repetition of the phrase, "I can't remember . . . "! I know that feeling oh so well. I felt as if I were right there with you. Thank you so much for your kind comments on my post. At least for you, it came across just as I intended. Blessings! And it's hard to even think about concrit when it's memoir, and I know this actually happened. It isn't fiction. I like the paragraph beginning "Everything stopped..." followed by the paragraph "Sound rushed back in..." That really gives you the idea that the first thing you notice freezing is sight, while the thing that comes back at you first is sound. I loved your writing on this. Those moments that fade from our memory of something as simple as a conversation to how the truck looked like a puppy at play. Truly enjoyed this piece and your skill of storytelling. How scary! I also loved your description of the truck looking like a puppy...I could picture it sitting in the intersection. I loved the repetion in the first and last sentence, "I can't remember..." This is so well organized and it's amazing all you remember that you "don't remember." Well done! This is so awesomely written..."It was my dream car." #sad that it was gone just like that - but as you said, you could've lost more. I'm glad you didn't. Thank you all for taking the time to read and comment! I do type fast--almost as fast as my brain comes up with things to type. I did end up going back this afternoon and fixing some typos. Somehow, the fingers on my left hand get ahead of the ones on my right, and then the words get scrambled! This was amazing, raw and still well-rendered. I understand that feeling so well. I was in the moment with you. Probably because it felt familiar. I think all who have been in a car crash will feel it as well... I too liked the threading of the phrase "I can't remember..." throughout the post. Somebody was looking out for you that day. I enjoy the breeziness of your writing. I loved your repetition of "I can't remember what we were talking about." It seems like an unimportant thing in light of what happened, but it's exactly that sort of thing that takes on a whole new importance after. It made for the perfect bookends to this story. I also loved this line: "We lost the car. We could have lost a lot more." Clearly, I have a thing for repetition and emphasis, but you just use it so well. Terrifying. I cannot believe that teenager had the gall to still be talking on his phone! And that line about the puppy is so vivid in my mind. Thank you again for posting this. The message is important! Hi takenit2thend2 - I'm so sorry for your loss! It's hard to know that everything can change in the blink of an eye. I knew the kid who hit us; I'd had him in class at the high school. 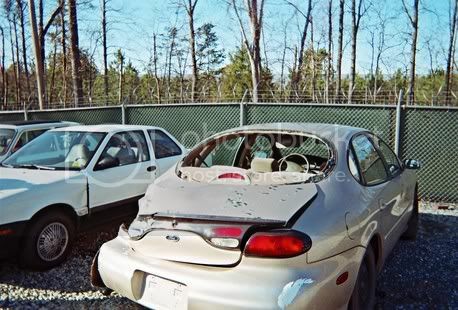 I found out dthat his truck had actually been "totaled" by their insurance co. the week before...when he'd hit a tree! I didn't realize how lucky we really were until I talked to the fireman who called 9-1-1. He actually started dialing before the truck hit us, and he looked away so he wouldn't see the actual accident, thinking it was going to be bad. I think he was nearly as relieved as we were to find that everyone was basically ok.